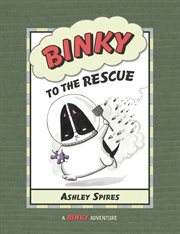 The item Binky to the rescue, [Ashley Spires], (electronic resource) represents a specific, individual, material embodiment of a distinct intellectual or artistic creation found in Austin Public Library. While in hot pursuit of an alien invader (a bug), Binky suddenly finds himself in outer space (outside) and must rescue his copilot Ted (stuffed mousie) from an enemy warship (wasps' nest)! Will Binky be able to save his best friend?